Hold on to your butts and get ready for a trio of dino packed digital pinball tables. Over the weekend, film fans got to set their eyes on a new trailer for Jurassic World during Super Bowl commercial breaks. However, nature found a way to keep the 25th anniversary celebration of the beloved Jurassic Park film franchise going beyond sequel teaser trailers. 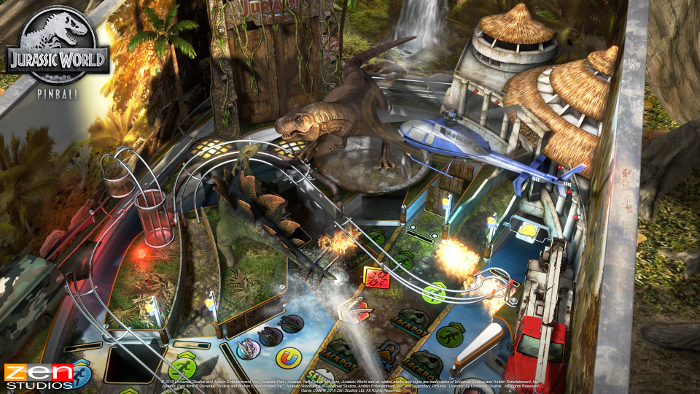 Or rather the team at Zen Studios found a way with a set of three brand new Jurassic Park-themed tables for Pinball FX3. "On the Jurassic World Pinball table, film dialogue from your favorite characters accompanies action inspired by iconic film scenes—from training Raptors and neutralizing Pteranodons to escaping the Indominus Rex and feeding the Mosasaurus. One mode even transforms pinballs into Gyrospheres!" "Zen Studios has spared no expense to bring you the finest video pinball adventure this side of Isla Nublar with its Jurassic Park Pinball table. Hear from classic film characters as you relive your favorite cinematic moments from the original film in a whole new way. Outrun the T. rex in an iconic Jurassic Park jeep, hunt Velociraptors or outsmart those clever girls in the kitchen." "Return to Isla Nublar on the Jurassic Park Pinball Mayhem table as you keep escaped dinosaurs at bay, deal with emergencies, rescue trapped workers, and help return the park to its former glory. You’ll even assume the role of a Stegosaurus battling a hungry T. rex." Players will be able to take on these dino-tastic tables on February 20 on PS4, Xbox One, Nintendo Switch, PC, as well as on iOS, Google Play and Mac through the Zen Pinball app.